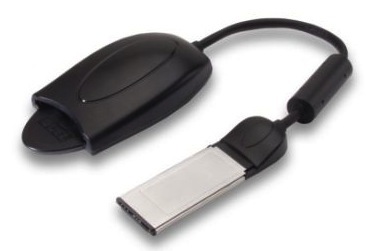 The time of PCMCIA/CardBus adapters is quietly running out. Modern laptops are increasingly replacing the traditional PCMCIA/CardBus slot with an ExpressCard slot. However old 16-bit cards are still widely used in different applications. 1. CardWare for Windows 10/8.x/7/Vista and Server 2012/2008 starting with version 7.00.008. The DuelAdapter PCD-X/XC34 is one of the rare ExpressCard-to-PCMCIA adapters available today supporting 16-bit cards, including (with some limitations) FLASH and SRAM cards. 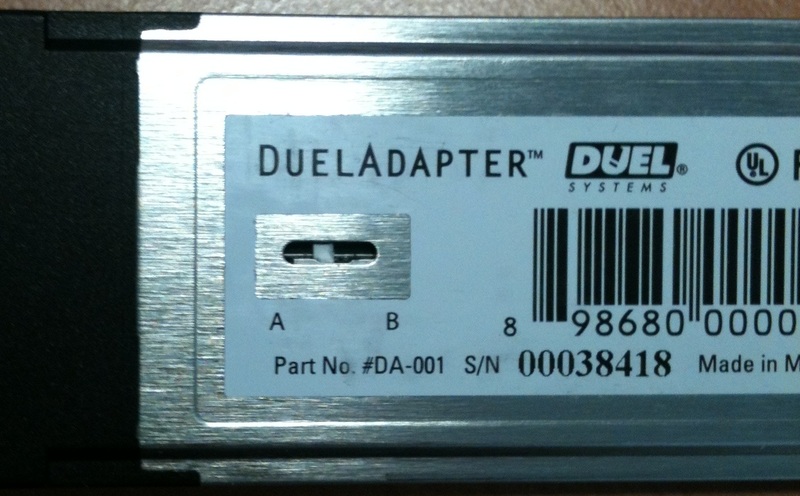 The Duel Adapter was originally produced by Duel Systems and sold by Quatech, Inc. as PCD-X/XC34. In October 2011 Quatech Inc. was acquired by B&B Electronics (http://bb-elec.com). Actually you still find this adapter from couple of resellers (including e.g. the Amazon.com) either under name of DuelAdapter or under name PCD-X/XC34. As a result of this carousel, in our experience, it is quite useless to expect a reliable technical support from hardware vendor(s). All information on this page is the result of our own experience with PCD-X/34 adapter. APSoft cannot guarantee that this information is a hundred percent accurate and true. However, most likely, this page will remain the only source of technical information and support for users that will take decision to use the PCD-X/XC34 adapter. We will appreciate any update provided by our customers. 1. CardWare for Windows 10/8.x/7/Vista and Server 2012/2008 starting with version 7.00.010. 2. CardWare for Windows 2000/XP and Server 2003 starting with version 7.00.019. The Delock Express Card / 34 supports both: CardBus cards and 16-bit cards (except SATA and Firewire cards). The Delock Express Card /34 can be found at https://www.delock.de/?setLanguage=en and sold through several resellers. All information on this page is the result of our own experience with Delock Express Card / 34 adapter. APSoft cannot guarantee that this information is a hundred percent accurate and true. However, most likely, this page will remain the only source of technical information and support for users that will take decision to use the PCD-X/XC34 adapter. We will appreciate any update provided by our customers. The PCD-X/XC34 is usually shipped with a short installation Guide and Driver CD with drivers for Windows XP and Mac OS X 10.4. There is no any updated driver for modern OS available. The Windows XP driver is our experience is quite unreliable and often causes blue-screen. Warning! Please never install the software shipped with PCD-X/XC34 with CardWare. The second quite obscure point of installation is a small switch on the back-side of the adapter. This switch could be set into one of two positions: "A" and "B". According to the installation guide, the position "A" is intended for MAC OS and position "B" - for Windows OS. In our experience, this information is inaccurate. We have some Windows Notebooks (e.g. Dell M6400) that are working only in "A" position. We were not able to get information about the exact physical meaning of "A" and "B". Therefore our only recommendation is quite simple: "just try". You will not damage the adapter by trying. Typically in one position, the PCD-X/XC34 will not be recognized by Windows at all (the Device Manager of Windows 7 will even not report this adapter as connected) and in another position the adapter will work just fine. The Delock Express Card / 34 is shipped with small multi-lanual User Manual. The manual describes installation under Windows 7 and Windows Vista only. Warning! When Delock Express Card / 34 adapter is used with CardWare, it's not recommended to install it as described in User Manual. In order to support the Express-2-PCMCIA adapter under modern Windows version, you need to install CardWare 7.0 for Windows 10/8.x/7/Vista and Server 2012/2008 version 7.00.008 or newer. Windows 8 and Windows Server 2012 support is available starting with version 7.00.011. 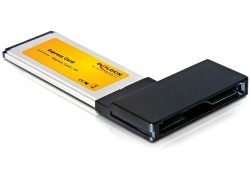 We recommend to install CardWare before connect the Express-2-PCMCIA adapter to your system. During the installation, please confirm that you would like to install both: "APSoft Memory Technology driver" and "APSoft System Device" (Please be patient: installation of each driver takes about 15 sec. each). In such case CardWare will pre-install required driver into Windows Device Store and will configure adapter properly at the first connection. However, if you connected the adapter before install CardWare - don't worry. You will be able to correct installation later. Depend of your hardware, Windows may fail the adapter installation and display the message shown below (in such case Device Manager will show adapter as failed). In order to correct this situation please disconnect the Express-2-PCMCIA adapter from the system and install CardWare 7.0 for Windows 10/8.x/7/Vista and Server 2012/2008 (version 7.00.008 or newer). During the installation, please confirm that you would like to install both: "APSoft Memory Technology driver" and "APSoft System Device" (Please be patient: installation of each driver takes about 15 sec. each). After system restarted, please reconnect the PCD-X/XC34 adapter to your system. Normally system will recognize and configure your adapter properly. In case your system doesn't configures adapter automatically, you may need to update driver manually. Important to remember, Express-2-PCMCIA adapter consists of two devices: PCI-2-PCI bridge and CardBus adapter. 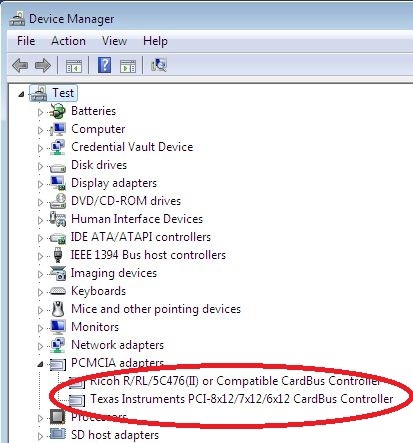 In order to get device configured properly, you may need to update the driver for the PCI-2-PCI bridge - not the driver for the CardBus adapter. For achieve this, please switch your Device Manager into "View by Connection" mode and locate your adapter in the device tree. Right-click on PCI standard PCI-2-PCI bridge and select "Update Driver Software". In following dialog you can either search for updated driver software automatically or select "Browse my computer for driver software". 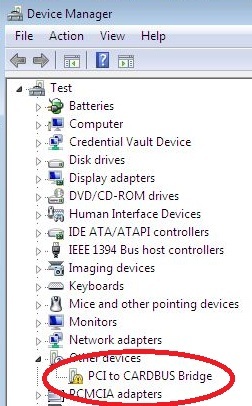 If you opt to Browse, in following dialog select "Let me pick from a list of device drivers on my computer" and then choose "Texas Instruments XIO2000(A)/XIO2200(A) PCI Express-2-PCI Bridge" instead of "PCI Standard PCI-to-PCI bridge". The Express-2-PCMCIA adapter is not supported under Windows versions prior to Windows XP SP3. The Express-2-PCMCIA adapter is supported with CardWare for Windows 2000/XP and Server 2003 version 7.00.018 or later. We recommend to install CardWare for Windows 2000/XP and Server 2003 before connect the Express-2-PCMCIA adapter to your system. However, if you connected the adapter before install CardWare - don't worry. You will be able to correct installation later. After installation of CardWare, system restarts. After system restarted, please connect the Express-2-PCMCIA adapter to your system. Depend of your hardware, Windows may fail the adapter installation and display the message shown below (in such case Device Manager will show adapter as failed). In order make the adapter functional, you need to update driver manually. For achieve this, please switch your Device Manager into "View by Connection" mode and locate your adapter in the device tree. 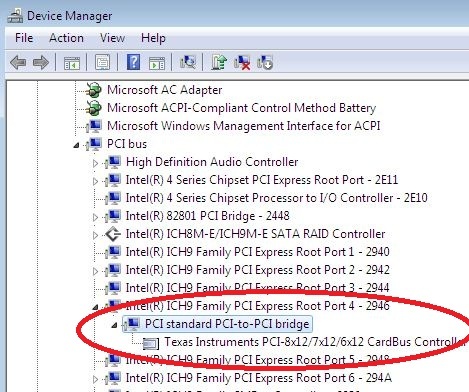 Right-click on PCI standard PCI-2-PCI bridge and select "Update Driver Software". The full installation procedure is shown on screenshots below. Attention! Please ignore warning about driver signature. All APSoft Drivers are always digitally signed! However Windows prior to Windows Vista recognize only Microsoft own signatures. 1. PCD-X/XC34 is not able supply 12V power. This limitation is quite common also for most of modern notebooks with a standard CardBus slot and described in several support articles on our WEB (e.g. http://www.tssc.de/support/cw2k/cw2k_14.aspx). Please notice that you will not be able format or write FLASH cards requiring 12V power for writing (e.g. Intel Series II). 2. Some Flash cards are not compatible with adapter. We found that some Flash Cards (such as Intel Value Series 100) are not recognized when they are inserted. This is not the limitation of CardWare, but an electrical problem on the PCD-X/XC34 adapter. Since we had only one copy of the adapter we cannot say if this problem is common for PCD-X/XC34 adapter or specific to our test item. Please be aware that insertion of such card may electrically lock the PCI bus (and, therefore, hang the computer). Removal of such card may cause computer restart. 3. Few ATA cards are not compatible with adapter. We found few old ATA cards (e.g. Intel PCMCIA ATA IDE 5MB) demonstrating the same behavior are described above for Flash cards. 4. List of compatible cards is not available. We were not able to get a list of "known compatible" or "known incompatible" cards from the adapter vendor. 5. Some Computers fail Standby when PCD-X/XC34 is connected. However the Hibernation works properly We found that some computers do not go into Standby properly. In fact, the system properly enters into Standby, but resumes immediately. It happens because system HAL doesn't process event properly. This misbehavior is computer related rather then Windows OS version related. The only way to standby is to disconnect PCD-X/XC34. All other types of Low Power mode (e.g. Hibernation) are working OK.
APSoft will appreciate if you will share with us your own experience with PCD-X/XC34 adapter by sending an e-mail to support@tssc.de with word "CardWare" in the subject line. 1. Some computers fail to start when Delock adapter is connected We found that some computers (e.g. Dell Precision M6400) fail to start (load BIOS) when Delock adapter is connected at startup. Some other computers are staring, however OS boot is very slow. APSoft will appreciate if you will share with us your own experience with Delock Express Card / 34 adapter by sending an e-mail to support@tssc.de with word "CardWare" in the subject line.